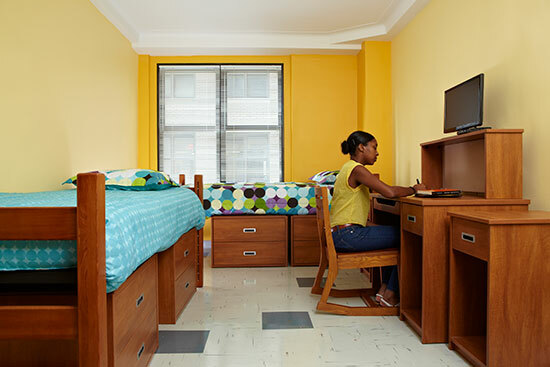 John Jay offers comfortable and caring housing options to its students. 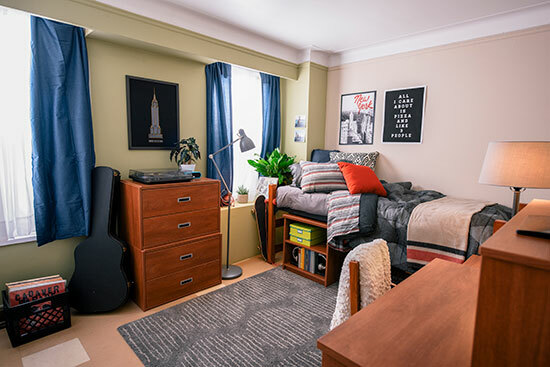 The College ensures that each residence hall has a welcoming home atmosphere, and each room includes amenities like study desks, chairs, chests of drawers, closets or wardrobes, wireless Internet access, and a cable connection. The residence halls are also conveniently located, offering an easy 15-minute subway commute to campus. 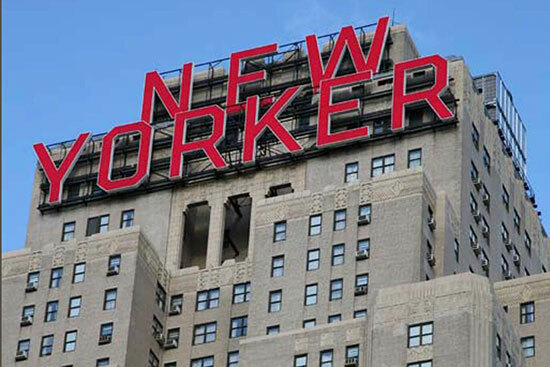 Living in the John Jay residence, the New Yorker, enhances the College experience and allows students to enjoy the campus situated in close proximity. Living in our student housing allows you to get more involved in our diverse cultural and athletic events, as well as our community outreach programs. Student government and team civility programs enable you to engage in civic and leadership opportunities on campus. The residence halls also provide an excellent social community for students to develop life-long relationships with fellow residents. When you stay in the John Jay residence, you will have access to myriad student support services, including career development, student counseling, health services, public safety and community service programs. Visit our Student Support Services for more information. Please be certain you are an accepted John Jay College student before completing the online application for housing. If you are accepted as a resident, you will receive a formal housing offer email containing all of the documents needed to finalize your accommodations for the upcoming academic year. Completion of the online housing application does not guarantee placement in the residence. The rates below reflect the charges for the full academic year. Students applying for housing for the spring 2020 semester will be billed only for the spring semester (January 27, 2020-May 25, 2020). 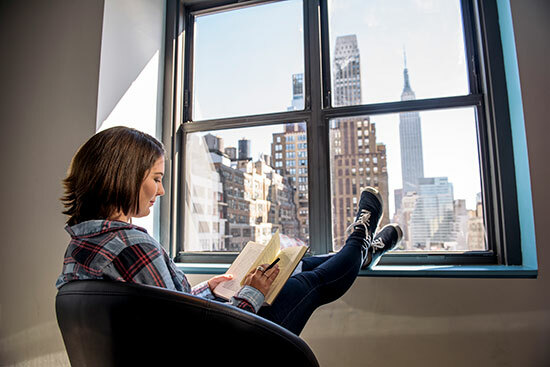 The John Jay College Residential Life and our partner Educational Housing Services (EHS) staff will work hard to ensure a smooth transition and support you in your desire to make a home at John Jay. Our Residential Life program also takes an active role in partnering with parents to ensure the development of body, mind and spirit of their students. John Jay College supports diversity and offers a residential experience with people of different backgrounds and cultures. The residence hall system does not discriminate on the basis of gender identity, race, culture, ethnicity, age, disability, sexual orientation, religion or national origin. Triple Room $15,275 A triple (three person) occupancy living space. 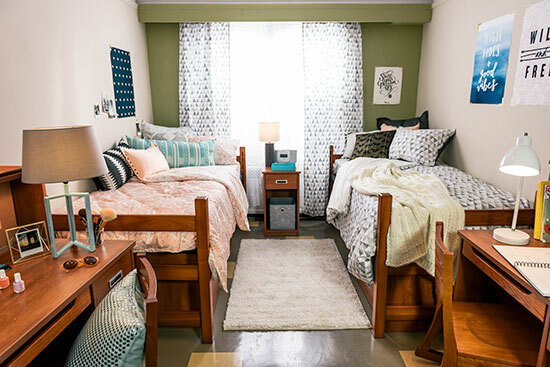 Each resident receives a lofted regular twin-size bed – loft-style beds are raised, with the desk and dresser underneath the bed for efficient use of space – and a desk with chair. The room features one or two private bathrooms, one wardrobe or closet, a flat-screen television with premium channels and a small-style refrigerator. Double Room $18,375 A double (two person) occupancy living space. Each resident receives a regular twin-size bed, two under-bed dresser units and desk with chair. The room features a private bathroom, closet, flat-screen television with premium cable channels and small-style refrigerator. Single Room $23,100 A single-person living space. This room is furnished with a regular twin-size bed, two under-bed dresser units and a desk with chair. The room features a private bathroom, closet, flat-screen television with premium cable channels and small-style refrigerator. Students accepted for housing for the spring semester only will be charged half of the academic year room rate. 1. How do I pay? A $400 Reservation Fee is due at the time the online housing application is submitted. Housing charges will be billed in two equal charges at the beginning of the fall and the spring semesters. The $400 Reservation Fee will be held by the College to secure against any potential damages to the room and be returned (minus damage charges) once the resident vacates the residence. All payments can be made through student’s CUNYfirst accounts. Payments received via check or money order can be submitted directly to the Bursar. John Jay College students may participate in the mohtnly payment plan. A payment plan is an easy and convenient way to manage your semester bill by providing a low cost option to budget tuition, fees and housing expenses. It is not a loan program- there are no interest or finance charges assessed and there is no credit check. The only cost is a per semester non-refundable enrollment fee. For more information on the Nelnet payment plan please visit https://www.jjay.cuny.edu/methods-payment. 2. Can I use my NYS 529 College Savings Plan to pay for housing? Yes. Please contact the Bursar's Office for more information. 3. How long is the Housing License Agreement? The contract is for one full academic-year commitment (two semesters). 4. Can I stay at the residence during College break periods? The residence will be open for students to stay on-campus during the Thanksgiving and Spring break periods. 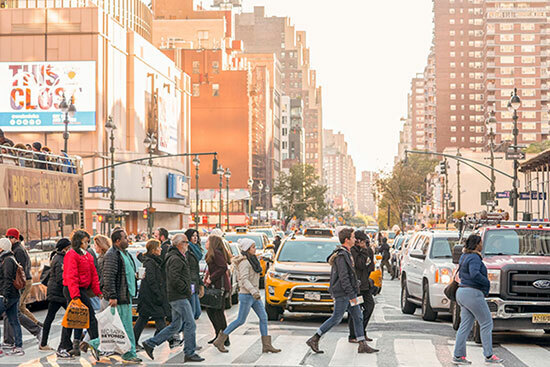 Students who are enrolled in winter session classes, international students, in-season athletes, or employed on campus/in the NYC area, must request and be approved to stay in the residence over the winter break period. All other students are expected to leave the residence at the conclusion of the fall academic semester and will be allowed to return at the start of the spring academic semester. Contact the Office of Residence Life for more information about winter break housing at RLHP@jjay.cuny.edu. 5. Can I stay in the residence hall for all my four years? 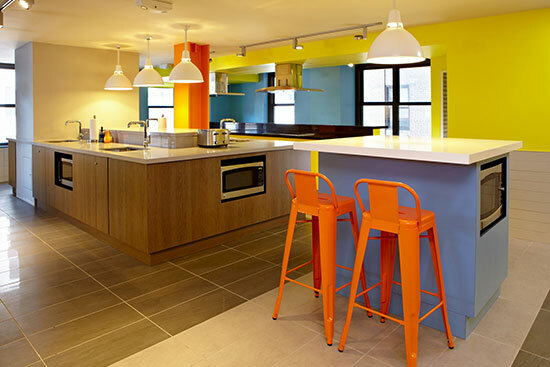 Residential housing contracts are only executed for one academic year at a time. Please note that current residents have the option to renew on an annual basis in the spring semester. 6. 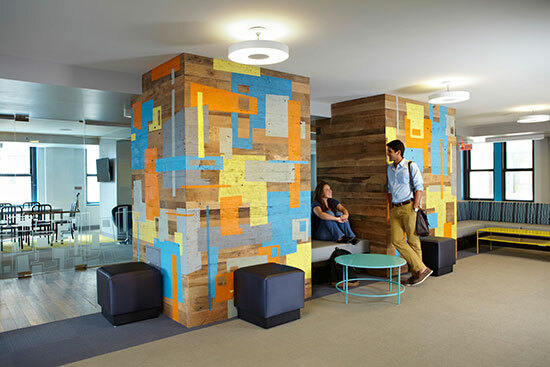 Does John Jay College provide summer housing? 6. How safe is the residence hall? Very Safe. 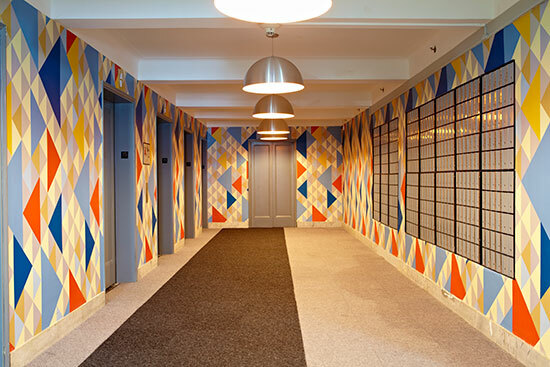 The residence hall maintains 24-hour security on location; all doors are locked, security cameras are throughout the building, there is a comprehensive guest policy and all must show identification upon entry. 7. Is the residence hall co-ed? Yes. However, double and triple occupancy rooms are shared by the same gender. 8. Are there other residence hall locations for John Jay College? No, the only residence hall John Jay College has is The New Yorker. 9. Who are the residence halls for? All matriculated, full-time enrolled John Jay students. 10. What are the amenities? 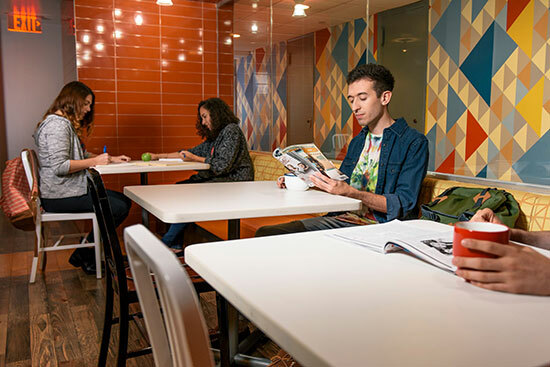 Amenities at John Jay College Residence Life include 24-hour security, professional live-in Student Life staff, room and residence key-card entry, fully furnished rooms, air conditioning, cable TV, high-speed internet in room, laundry facilities, and communal kitchens and lounges. The student lounges are open 24 hours. 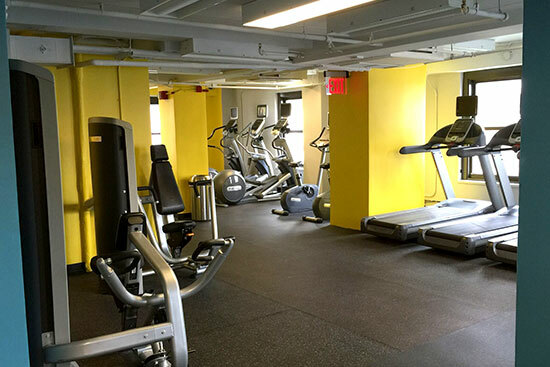 The kitchen and fitness center are open daily from 6am until midnight. 11. What is the closest train and how long does it take to get to campus? The A, C, 1, 2, and 3 trains on 34th Street all can get you to campus in about fifteen minutes. 12. Are there washer and dryers in the residence? There is a laundry room in the residence hall and all you'll need is laundry detergent. There are no dispensers in the laundry rooms. Your own laundry basket or bag is also a handy thing to have. You must pay to use the washers and dryers, but will text you when your clothes are ready. 13. Can I smoke in my room? Smoking tobacco or any other substance (and including “vaping” or the consumption or use of electronic cigarettes) is not permitted in your rooms or anywhere else in the building. If you need to smoke, please do so outside the building but do not loiter directly in front the building, and do not block the entrances. 14. Can I request to live with my friend? Yes, you can indicate your friend's name on our roommate application form when you apply, but requests cannot be guaranteed. Roommates must be the same gender. 15. Will I be able to switch roommates if we do not get along? Every effort is made to work with roommates to ensure they are able to peacefully coexist in the same living environment. John Jay Residence Life Staff are all available to assist roommates who may have conflicts. Taking into account the transition period for all first year students, roommate changes are discouraged in the first semester. Situations will be evaluated on a case-by-case basis by the Office of Residence Life. 16. Is there a storage facility for my bike? No, you must store your bikes in your room. 17. Are there cable, phone, and/or internet connections in the rooms? Yes, those are all included in the housing rate at no extra cost. There is also wireless internet connection. 18. Are we allowed to have any pets? No. There is a no pet policy (this includes fish). While pets are prohibited in our buildings, our staff, [including the College’s Office of Accessibility Services] will review requests for the use of an Emotional Support Animal in the New Yorker Residence Hall (the “Residence”) by students with documented disabilities and will make decisions regarding reasonable accommodations on a case by case basis. 19. Are there accommodations for persons with disabilities? If you are a person with a disability and require accommodation, please contact the Office of Residence Life at RLHP@jjay.cuny.edu. Please click the Apply Now button on March 1, 2019 to submit your application for housing for the 2019-2020 academic year.